We are pausing our live coverage of Hurricane Irma as the US authorities continue to assess the damage in Florida and beyond. Our full coverage of the storm continues at BBC.com/news. Officials in Florida are warning residents not to rush to get back to their properties. As well as the risk of long traffic jams, more than 6.5 million homes and businesses across the state are without power. Florida Governor Rick Scott's office has released pictures of the governor on a flight over the town of Naples on Florida's west coast, near to where Hurricane Irma made landfall on Sunday hours after hitting the Florida Keys. "People here are hungry, tired and desperate for anything they can eat" - The BBC's Laura Bicker reports from a newly opened supermarket on the devastated Tortola in the British Virgin Islands. Video caption: The BBC's Laura Bicker reports from the British Virgin Island's Tortola.The BBC's Laura Bicker reports from the British Virgin Island's Tortola. The giant storm has left a trail of massive power outages, downed trees and flooded homes. A flash flood emergency has been issued for Charleston, South Carolina, as Irma, which has been downgraded to a tropical storm, continues to bring torrential rains and storm surges in parts of the US south-east. A tornado watch has been issued for parts of Georgia and along South Carolina's coast, including Savannah and Charleston. National Security Adviser Tom Bossert said at a news conference on Monday the federal government was focusing on emergency rescues, power outages and flooding in places like Jacksonville, where storm surge flooding has surpassed a record set by Hurricane Dora in 1964. "Jacksonville and the Keys are taking a considerable amount of our attention right now," Mr Bossert said. "If you are able, take care of strangers and others in need," he added. Actress Kristen Bell was in Orlando filming a movie and staying at a hotel at the Walt Disney resort when powerful Irma hit, according to the AP news agency. She dropped by a middle school that was being used as a shelter to perform a few songs from the hit Disney movie. BBC World Service journalist Jaime G de Gispert is surveying the damage in Miami, where emergency relief operations are under way. About 400 survivors of Hurricane Irma have arrived in France and the Netherlands aboard military planes, AFP reports. Some 278 survivors landed in Paris, while another 100 flew into Eindhoven which is in the south of the Netherlands, the news agency says. Earlier, French officials said six out of 10 homes on St Martin, an island shared between France and the Netherlands, were now uninhabitable. They said nine people had died and seven were missing in the French territories, while four are known to have died in Dutch Sint Maarten. The Florida Power and Light Company are working to restore power. They have posted a video of crews working on the state's east coast. Earlier on Monday, Florida's State Emergency Response Team said six million homes - 62% of the entire state - were without power. But the Associated Press now reports that the number has risen to more than seven million. Mike Theiss, a photographer for National Geographic, has posted videos of the flooding in Key West, Florida. 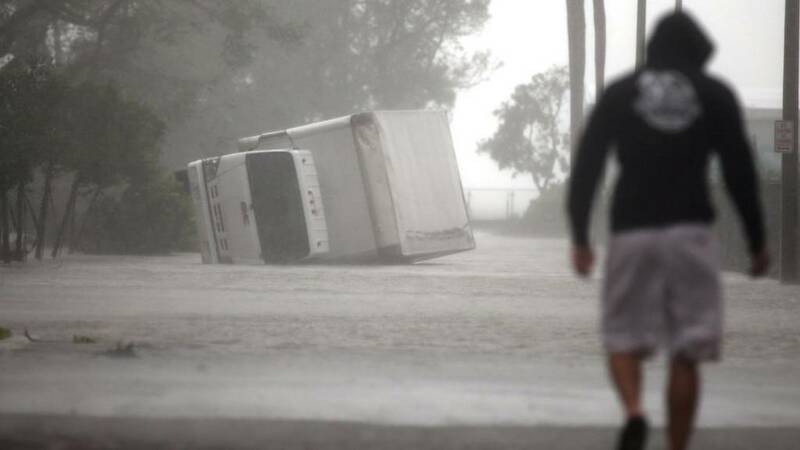 The area was hit by Irma's extreme winds and storm surges. Officials in Florida have advised against driving, but the strong winds brought by Storm Irma have taken that decision out of some people's hands. Erica Rakow, a reporter for WPLG in south Florida, has shared images of cars that have been crushed by falling trees. The BBC's Luis Fajardo is in Marco Island, just off the coast of south-west Florida, where a dolphin has become stranded due to Irma. Sunny Isles Beach, 15 miles (25km) north of Miami, is "in lockdown" and roads to it are "impassable right now", the city's mayor told the BBC. But Budd Scholl said it could have been even worse. Video caption: The mayor of Sunny Isles Beach says Storm Irma was "ugly but could have been a lot worse".The mayor of Sunny Isles Beach says Storm Irma was "ugly but could have been a lot worse". Mike Theiss, a photographer for National Geographic, has shared an image showing part of a highway in the Florida Keys that has been severely damaged by Irma. The BBC's Laura Bicker is on Tortula in the British Virgin Islands. "People tell me they desperately need food and supplies," she tweeted. Read more on the current situation there. The BBC's Jane O'Brien is in Miami and says the recovery from Irma is "under way in earnest". Officials say 72% of the city is without power and confirmed a number of people have been arrested for looting overnight. Video caption: The BBC's Jane O'Brien is in Miami where the recovery from Storm Irma is under way.The BBC's Jane O'Brien is in Miami where the recovery from Storm Irma is under way. The first flight of 100 evacuated Dutch tourists from Sint Maarten have arrived home to the Eindhoven military base. The hurricane has killed at least 37 people in the region and left thousands homeless. BBC correspondents report from the British Virgin Islands, which were ravaged by Hurricane Irma. Miami, Fort Lauderdale, Naples and Hollywood are among the places Hurricane Irma has hit. Amateur footage shows river levels rising in the Brickell area after Irma struck. Floridians still remember Hurricane Andrew and the devastation it caused in 1992. The Caribbean island felt the force of Hurricane Irma, with houses destroyed along the north coast. Amateur footage shows Key Largo, where the sea has been drawn away towards the hurricane's centre. The Hurricane Hunters who fly into the eye of hurricanes.